How the intrepid daughter of a controversial father weathered ups and downs in life to create a strong family bond and build a successful career. In August 1992, Radikaa Sarathkumar was on a hospital bed recuperating from the exhilarating experience of delivering a baby. Rayane was her first child, and Radikaa, like any other first-time mother, was excited about what motherhood held in store. She had a steady stream of visitors, and one of them was Bharathiraja, her first director. With his good wishes, he had brought along a script. Much to her surprise, it was a movie script with a role for her. Just two months into motherhood, she found herself in a village in Vathalakundu in Tamil Nadu, shooting for Kizhakku Cheemayile (‘In Eastern Province’, released in 1993). It was the same director, Bharathiraja, who took her on board for her first movie Kizhake Pogum Rail (‘Train headed towards the East’) in 1978, which catapulted the then 15-year-old actress to stardom. If the train towards the east took her to fame and popularity, the 1993 movie would help her understand her life better and move into unchartered waters of her career. That was the beginning of Radaan, the production house which went on to revolutionize the Tamil TV industry. On February 13, 2016, R Radikaa Sarathkumar, the Chairperson and Managing Director of Radaan Mediaworks, is having a busy Saturday at her office in T Nagar in Chennai. She is attending a board meeting, finishing her office chores and is taking her mother out in the evening. She promised to spend an hour on this interview, so I am there early, hoping to catch every available second. As she briskly walks out of the board room, she asks me to follow, and I scamper after her into the office. Her staff members are with her, and they are discussing work. As we sit down, she starts signing cheques from a huge bundle. “Yes, go ahead,” she says, continuing to sign the cheques. My first question, a rather nervous one, is how she would define herself, and she has one phrase - “work-oriented”. Across the industry, Radikaa has the reputation of being a workaholic. Her sense of humour is legendry, and she loves to party and spend time with her family. But at work, she is a tough boss who works relentlessly and passionately towards her goals, and takes her team along. Radikaa on the sets of her ongoing TV mega-serial, Vani Rani. “I just like what I am doing, and with that comes a deep sense of commitment. And the commitment keeps me going,” she says. She shoots almost every day, for her own TV serials and movies which she has signed. Her daughter Rayane is getting married in August this year. “It’s very hectic, and it is all about time management,” she says. But on Sundays, she does not budge, “I stay at home and cook, spend time with family. And I do not work beyond 6PM on any day. “The days of crazy schedules and night-shoots are over, I did it for 20 years.” She likes to entertain guests and friends at home, and backs her husband’s political career throughout despite her own hectic life. Apart from several other projects, Radaan does four major shows now, three in Tamil and one in Telugu. “We are working on few more scripts in Tamil, Telugu and Kannada,” she says. It’s a life of balance now, but it wasn’t always like that. Radikaa Sarathkumar was born on August 21, 1963 to veteran Tamil actor and politician ‘Nadigavel’ MR Radha and Geetha, a Sri Lankan Tamil. The 60s and 70s were controversial times for MR Radha. In 1967, he shot veteran actor MG Ramachandran with a gun before going for his own head. Both survived the bullet injuries, but MGR lost his voice and MR Radha was incarcerated. “My mother did not want me to be exposed to what was happening here. I was studying in Chennai initially, but when my father was having his problems, we went to Colombo and I was studying there. I went to London when I was 14. I wanted to do a course there, but I was travelling back and forth between London and India,” she explains. During the Christmas break of 1977, when she was home in Chennai to meet her father, she had a surprise visitor – Bharathiraja. He had chanced on a photograph of hers at a friend’s house, and curious, he sought her out and walked into her house one day. Radikaa, a teenager who preferred books over movies, was offered a role in his next film. Her mother encouraged her to give it a shot. “I didn’t come to films as a choice. I didn’t come wanting to be an actor. I never had dreams, never knew what was acting. I was not acting material. I didn’t look like an actor, I was not brought up as one – I was in hostels most of my life, I was travelling. I came accidentally into movies,” she says. It turned out to be a happy accident. Kizhake Pogum Rail turned her into a celebrity overnight, and before she knew it, she had signed up her second and third film. “If my first film was a flop, I would have gone back to London. But after that I did not have time to think. I signed more movies and I was now an actress. It was all a blur,” she says, adding that at that stage, she never thought about roles and image – she was just thrown into movies. Her career’s defining moment was her entry into Telugu cinema with the movie Nyayam Kaavali in 1981. Till then she was a young actress who was being pushed around. Now, cinema was her career. The Telugu industry was different, and the people were new. It was more disciplined too. “My focus was more, and I started reinventing myself as an actress. I decided that I had to be good at whatever I did,” she says. After a few Telugu movies, Tamil cinema rediscovered her, as a star who can act well and don strong roles. It was another high in her career. Throughout her interview, she repeatedly refers to the “ups and downs” in her life, and she doesn’t mean her career alone. She was believed to be married to actor Prathap Pothen in 1985, but she never was. The relationship was short-lived and they parted ways soon. Later in 1990, she married a British man Richard Hardy, with whom she had her first child Rayane. But that marriage would end in 1992, and Hardy is no more now. Even today, those who have known her through the years talk about how it was her steely resolve and fierce independence that took her towards building a strong family, but she herself is cagey about it. Does she want to talk about her personal life? “Well, there is nothing very interesting in it. Not to me at least, may be to others,” she says looking away, in a decisive tone. But she is willing to talk about Sarathkumar, her actor-politician husband. 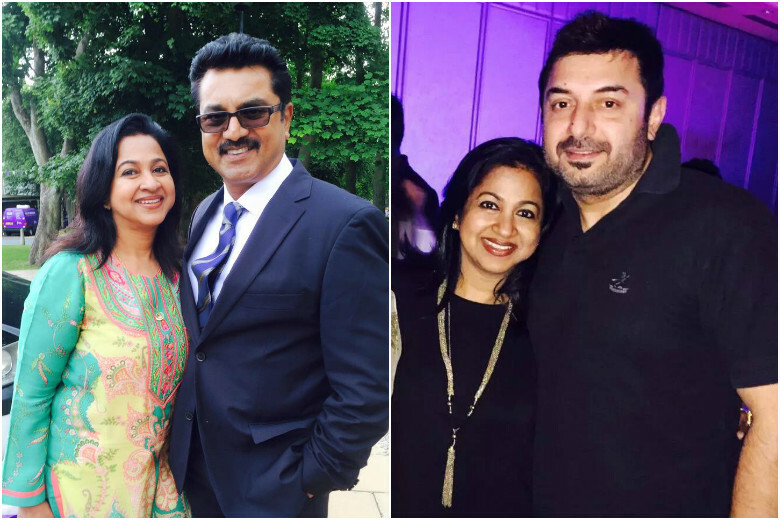 Several years ago, Radikaa, Sarath and Arvind Swamy were a small gang of friends. They used to hang-out together, and even teamed up for a massive Kargil war fund-raiser campaign. 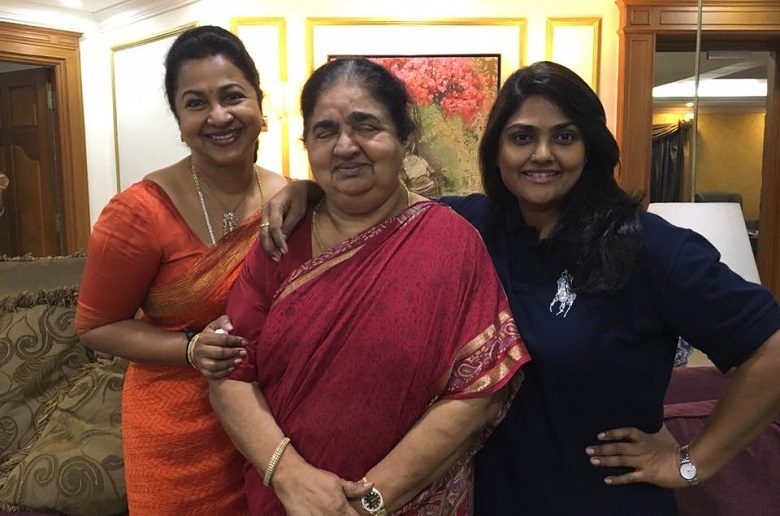 Her mother was a strong, independent woman herself, and was instrumental in shaping Radikaa’s life. The mother's advice prevailed. In February 2001, she got married to Sarathkumar. Since then, the couples grew together to become one of the most powerful in Tamil cinema and TV. So how do they enjoy being the power couple, dabbling in cinema and politics? “Funniest thing is we never talk about movies. We never talk about issues like Nadigar Sangam. If he had discussed, I would have told him not to stand,” she says trying to explain that they were an ordinary couple, “We are just a normal family, fun-loving. Sarath is very family oriented,” she says. She had a child with Sarath, named Rahul, in 2004. But if she is able to spend time with her family now, it’s because she has worked hard to establish Radaan as a successful production house. 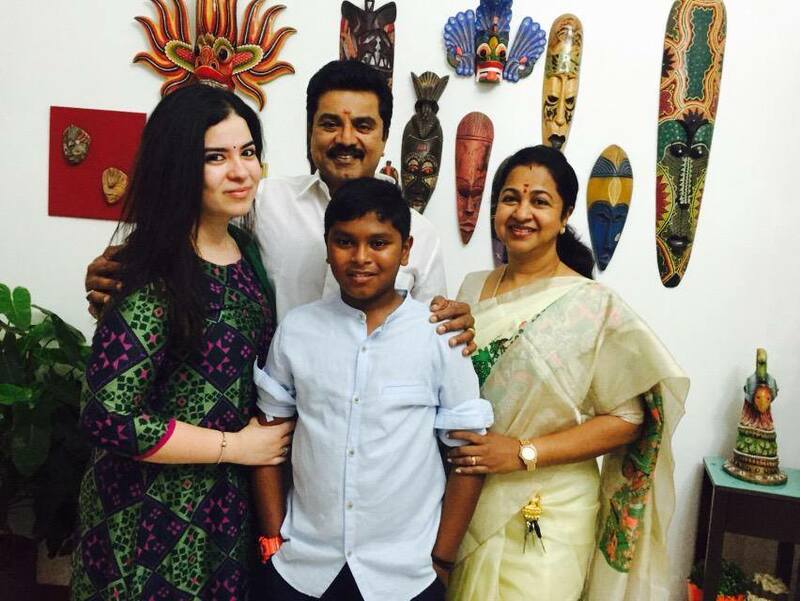 Radikaa with daughter Rayane, son Rahul and husband Sarathkumar. In 1994, Radikaa’s decision to enter the industry with Radaan TV was a professional and personal one. She could work out of Chennai instead of having to run around, “And I was not going to be pushed into the role of mother and sister of other actors,” she quips in with a smirk. It was a bold decision for one more reason – she wasn’t just acting, she was going to produce TV serials too. That was a demanding task. “I was cheated by every single person. I was doing everything, writing, acting and controlling the production. I had a child… and it was disastrous! People were taking the mickey out of me!” she says. She was a respected actress, but people also assumed that she was a dumb heroine. Banks would not fund her. People would be nice to her, but they did not trust her with productions. Her first mega-serial was with ETV Telugu, a weekly called Idhi Kadha Kadu. In Tamil, her first show and another weekly was on JJ TV, now known as Jaya TV. Then Sun TV too gave her a weekly. 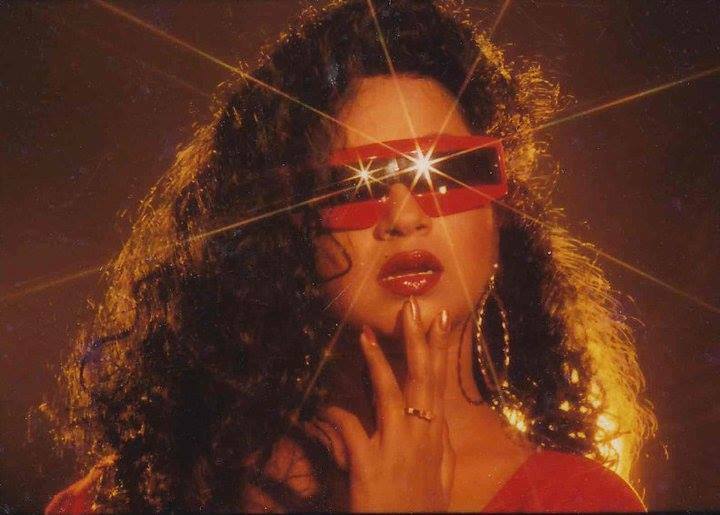 In 1999, she renamed her production house Radaan Mediaworks. It was the super-hit Chithi, which aired on Sun TV at prime time slot, which opened the floodgates to her TV success. After Chithi, Radaan was never the same again, and neither was the Tamil TV industry. With Chithi, the dynamics of Tamil television changed, but for Radikaa, this was just another feather in her cap. “My biggest problem then was to keep the unit grounded. The director started thinking he was Cecil DeMille, but I told them ‘hello boss, this is just work’,” she says, knocking the knuckles on her desk.